Discover pristine beaches, relaxed evenings by the sea, and an abundance of welcoming locals on a 3-star holiday to this beautiful Thai island. Explore picture-perfect coasts, where craggy-limestone formations burst out of the crystal-clear sea, on a fabulous 4-star holiday to Krabi. Sparkling, turquoise waters, striking limestone cliffs, and quiet, secluded coves. 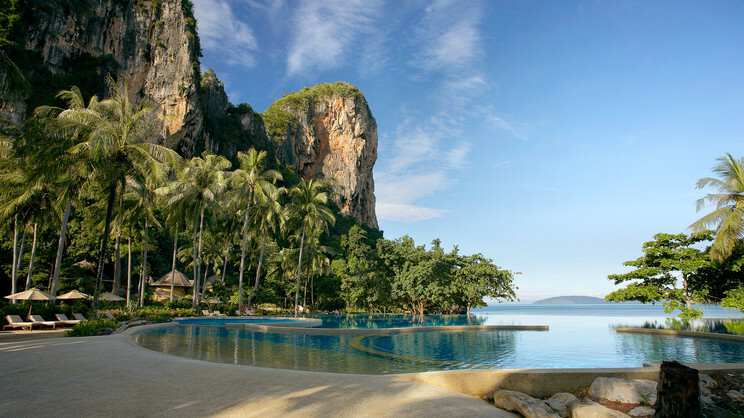 Krabi is the ideal setting for a 5-star luxury holiday of a lifetime. Krabi’s peaceful atmosphere and slow pace of life, make it an ideal destination to combine with an exciting city break. Take your pick of these fabulous 3, 4 and 5-star multicentre holidays. Thailand’s Krabi province is made up of a collection of small islands and coastal resorts, which include Ao Nang and Krabi Town. This picturesque region of Thailand, located 400 miles south of Bangkok, is renowned for its stunning beaches, striking limestone cliffs and expansive rainforests. What holidays to Krabi can offer holidaymakers is a glorious alternative to the bright lights of Bangkok and the party towns of Phuket, making it perfect for those looking for more relaxed holiday. Venture around this superb part of the country and you will find a number of small fishing villages, and grand historic monuments. Krabi’s immaculate beaches and secluded coves make it one of Thailand’s most popular holiday destinations. Holiday to Krabi give you access to pristine beaches and resorts. Ao Nang is no exception and is seen as the region’s main beach resort. Ao Nang is home to a number of shops, restaurants and luxury accommodation. Those staying in Ao Nang are spoilt for choice when it comes to fun activities and cultural pursuits. Among the area’s top attractions are the Ao Nang Thai Boxing Stadium, boat tours of the Andaman Sea and a selection of spa retreats. Joining Krabi’s line-up of places worth visiting is Railay beach. The secluded bay is a private paradise that’s only accessible via boat. A setting reminiscent of Alex Garland’s cult novel The Beach. The idyllic coastal stretch will also appeal to adventurous types, with rock climbing and guided tours also available. Continuing in a similar vein is the Khao Phanom Bencha National Park, located to the north of Krabi Town, where visitors can explore rainforests and take in the park’s idyllic waterfalls. On top of being a supreme Thai beauty spot, Khao Phanom Bencha also provides a habitat for a wide-range of wildlife, including monkeys! Krabi Town is the province’s main hub, where visitors will find bustling downtown markets, and a wide-selection of restaurants and bars. On top of beaches, holidaymakers travelling around Krabi will want to set aside some time for a visit to the Tiger Cave Temple. The sacred Buddhist site, situated to the north of Krabi Town, is perhaps one of the region’s most sacred sites. A golden Buddha statue sits at the top of this breathtaking landmark, which is reached via a 1272 step stairway. A stay in any one of Krabi’s fantastic resorts will not disappoint. Adventurous types looking to explore the wider region will be able to do so with ease, either by hiring a car or taking advantage of one of the many excursions or tours that are put on around the region. For more information on Krabi holidays, call Destination 2 on and speak with one of our friendly and knowledgeable travel experts. In Krabi, You can expect hot weather throughout the year with temperatures ranging from the high twenties to mid-thirties. Krabi’s rainy season usually begins in June and can last until October. That being said, you can still expect plenty of sun during this period. The best time to visit Krabi is between November and March, when you can expect drier conditions and plenty of sunshine. You’re looking to experience a more laid-back and quieter part of Thailand that’s more suited to a relaxing escape.